Last year bumped into the documentary We Don’t Care About Music Anyway. I thought it was quite interesting to see what these artists were up to as well as to get a glimpse into another culture. 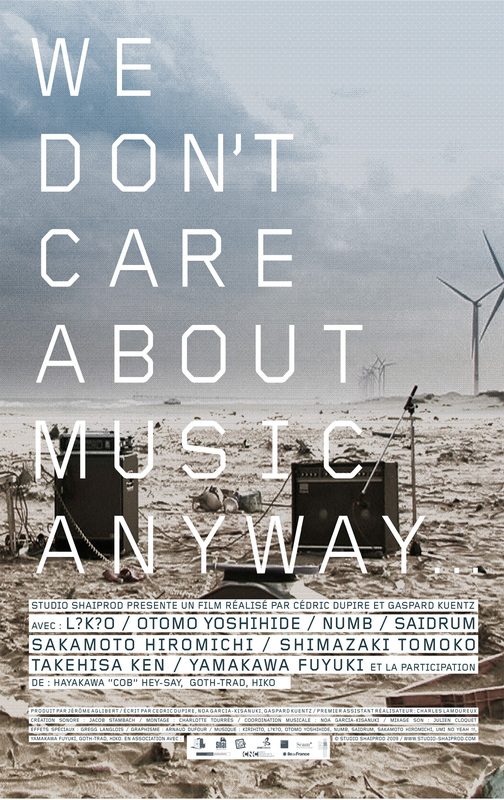 WE DON’T CARE ABOUT MUSIC ANYWAY follows eight Japanese noise musicians as they perform against Tokyo’s urban wasteland and expose the process of their collective musical madness, from scraping a cello’s metal spike across broken glass like a DJ scratching a record to taping a microphone to one’s chest to improvise around a volatile heartbeat. The film is itself a piece of noise, with a soundtrack that stands alone in it own right, and with cinematography suggesting an impending self-destruction of Japan’s consumerist society. I just discovered SnagFilms which is streaming this and other films and documentaries for free. They’ve published the film on YouTube which you can watch in the player below (or at this link). You can also watch the film from the SnagFilms app on your mobile device, Roku, Kindle, and some smart TVs.